Ahead of Egypt’s final match, against Saudi Arabia, at the 2018 World Cup, reports began to emerge that star player Mohamed Salah planned to retire from the Egyptian national team following the quadrennial tournament. The news came during a difficult week for the Egyptian team, who lost their opening match against Uruguay before suffering an unexpected 3-1 defeat to host nation Russia in their second group-stage game. The consecutive losses brought a premature end to the Pharaohs’ first World Cup campaign in 28 years. Though Salah was not quoted in the CNN report about his impending international retirement, sources close to the Liverpool winger claimed that he felt “exposed” by the Egyptian Football Association (EFA) after the organization allowed him to be used to enhance the image of Chechen dictator Ramzan Kadyrov, a warlord who has been accused of ordering assassinations and carrying out countless human rights violations, including mass torture. This marked Salah’s latest conflict with the EFA, with which he has had a tense relationship over the past year, and highlights the ongoing crisis within Egypt’s most influential sports federation. Understanding Salah’s potential retirement and the various reasons behind it begins by understanding the EFA’s strange kinship with the Chechen Republic. This newfound relationship between Kadyrov and the EFA is the latest example of the Chechen dictator’s growing ambitions in the Middle East and North Africa, and highlights how he uses sports to facilitate diplomatic relations between the Chechen Republic and other Muslim-majority countries. This form of sports diplomacy was particularly evident when Egypt’s ambassador to the Russian Federation accompanied the Egyptian national team to Grozny and had iftar with Kadyrov. In this case, the EFA took on the role of the sports envoy there to enhance the relationship between Egypt and the Chechen Republic. Since Kadyrov’s rise to power in 2007, a long list of athletes and other celebrities have visited Chechnya at the strongman’s personal invitation. These include actors Jean-Claude Van Damme and Steven Seagal, boxing champions Floyd Mayweather and Mike Tyson, as well as former UFC champions Fabricio Werdum, Frank Mir, and Frankie Edgar. Each of these visitors played a role in helping Kadyrov legitimize his rule and distract from the brutal aspects of his reign. Each played a role in bolstering Kadyrov’s political image. In Mo Salah, Kadyrov was not only gifted one of the most popular soccer players in the world, but one of the most beloved athletes across the Muslim world. Given that Kadyrov is the most influential politician for Russian Muslims and considers himself to be their representative, his association with Salah came with added incentive. By anointing Salah an honorary Chechen, he is effectively laying claim to one of the most successful Muslim athletes of this generation, with the encouragement of Salah’s own federation. Hours after Mohamed Salah arrived in Grozny, the Chechen capital selected by the EFA as the national team’s training base for the duration of the World Cup, he was roused from sleep and informed that the Head of the Chechen Republic was waiting for him in the hotel lobby. Surprised by the sudden and unexpected guest, Salah got dressed and met with the Chechen autocrat, who informed the player that he wanted to take him for a quick drive to the city’s football stadium, where they would pose for pictures in front of several thousand Chechen supporters. Salah obliged. What ensued was a public relations nightmare that marred the Egyptian team’s first World Cup in 28 years, caused significant media backlash, and haunted the EFA throughout its stay in Russia. Over the course of the next few days—still ahead of Egypt’s opening match against Uruguay on June 15—pictures of a bemused Salah posing with Kadyrov and his cronies began to circulate on social media and among major Western outlets. In some of the photos, Salah was being embraced by Kadyrov and Magomed Daudov, a reformed militant and Chechen parliament member who is also president of Chechnya’s football club, Akhmat FC. Daudov is one of the most powerful men in the Chechen Republic, and has been implicated in torture of gay men during Kadyrov’s deadly crackdown on the LGBTQ community in 2017. 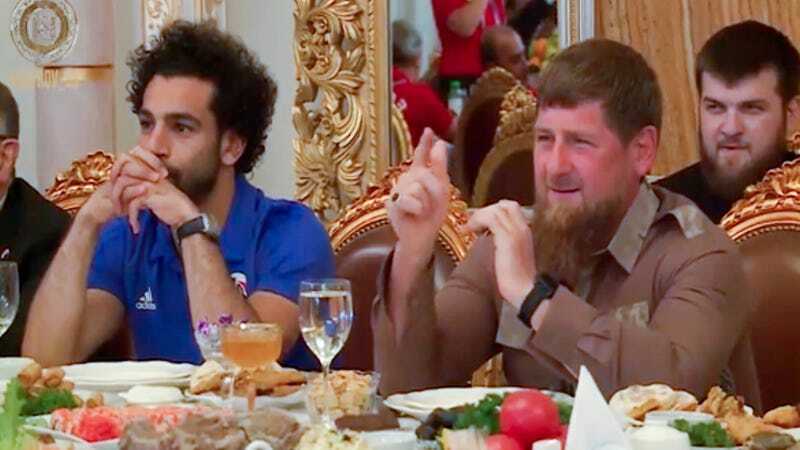 Kadyrov continued to play up his friendship with Salah over the coming weeks. Following the Egyptian team’s 1-0 loss to Uruguay in their first game—a match that occurred on the first day of the Eid-al-Fitr holiday as well as on Salah’s 26th birthday—the player was greeted with a 100-kilogram cake emblazoned with both the Chechen and Egyptian flags upon the team’s return to Grozny. This, too, was photographed and posted on Kadyrov’s social media. Kadyrov persisted with his attempts to befriend arguably the most popular Muslim athlete in the world. Prior to the Egyptian team’s final group stage match against Saudi Arabia, the Chechen leader hosted a farewell dinner for the team. Salah was seated alongside the dictator on a raised table, while the rest of the team was squeezed into a couple of tables a distance away. Kadyrov jumped at this opportunity to award Salah honorary Chechen citizenship, before pinning a badge on his shirt and handing him a decree. Naturally, he bragged about this achievement on his social media accounts. The Kadryov controversy doesn’t appear to be the only reason Salah might have to turn his back on the EFA. CNN’s report that Salah was contemplating his resignation from the Egyptian national team may have caught the federation by surprise, but it was not the first reported issue between Salah and the association during their time in Russia. Following Egypt’s 3-1 loss to Russia in St. Petersburg, reports began to circulate in Egyptian media that Salah had confronted members of the EFA following the match and criticized them for mismanagement of the team, a poorly run training camp, and caring about its image more than the team. The report asserted that the EFA had invited more than 100 celebrities, musicians, businessmen, and politicians to attend the tournament, which included paying for their flights and accommodation. Salah reportedly criticized the EFA for allowing these celebrities and notable figures to come into the Egyptian camp ahead of their match with Russia, as their presence distracted the team from its preparations. While it remains unclear why the EFA reportedly allowed such distractions into the team’s camp, it emphasizes the extent of the association’s mismanagement when it came to handling the athletes’ wellbeing, as well as their concerns. The EFA denied any tension with Salah but refused to comment on the rest of the report suggesting celebrities were present at the event. Sherif Mounir, a renowned Egyptian actor, has since confirmed his presence in Russia for the tournament, as well as the EFA’s involvement in his travel. He also criticized the Egyptian fans who complained about the presence of actors in Russia. Salah eventually tweeted that the “Egyptian team remains united,” though he made no mention of the EFA or its members named in the reports. All of this preceded Egypt’s final group stage match against Saudi Arabia and the CNN report that Salah was considering his retirement from international competition due to his anger with the EFA for exposing him to Kadyrov and for allowing him to be used as propaganda. The news was later confirmed by ESPN and the Associated Press. In the end, the EFA got the World Cup campaign it deserved. The association entered the tournament blessed with perhaps the greatest player Egypt has ever produced, playing in the best form of his life. Instead of doing what they could to build a stable, winning culture around Salah, they allowed him to be paraded around by a Chechen dictator and made to participate in a twisted sideshow. Salah deserved better, of course. After washing out at Chelsea as a youngster and then reviving his career at Roma, he returned to the Premier League with Liverpool and produced one of the greatest single seasons in league history. His club campaign ended with a heartbreaking injury that knocked him out of the Champions League final, a game Liverpool went on to lose to Real Madrid. The World Cup should have been a coronation for Salah, a chance to cap off his incredible season by showcasing his talents on the world stage and receiving the adoration of the millions of Egyptian fans for whom he has become a national hero. Instead, he ended up with three crushing losses and having to deal with a football association seemingly hellbent on alienating him at every turn. If there’s reason to be hopeful that Salah can move past this disastrous World Cup, and to believe his reported threat of international retirement won’t come to pass, it’s in his considerable star power. Salah means more to Egyptian soccer and its fans than the EFA does, and if any one player is positioned to win a fight against an entire federation, it’s him. Just the reports of his dissatisfaction already seem to be getting results. In response to Salah’s alleged anger, the Egyptian parliament has opened an investigation into the EFA, citing corruption, team mismanagement, and the EFA’s decision to use Grozny as their training base. This could lead to an overhaul of the EFA, effectively weeding out the corrupt officials within it. The sooner this happens, the better off Salah will be. He’s an incredibly gifted soccer player and a hero to his people; he deserves to be treated like one at the next World Cup.